Our rooster, “Roosty” has moved on to the big chicken coop in the sky. He kept track of all his ladies as they free-ranged together for over six years, outlived all the hens and never once used these impressive spurs on a person. He was a good rooster. We’ve got a batch of young birds with a few roosters in it and I’ll be crossing my fingers hoping one of them may be worthy of taking Roosty’s place. 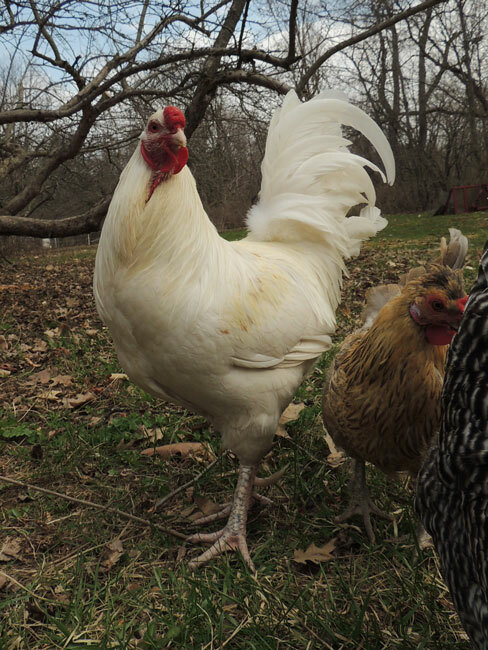 When you have chickens, like we do, and in conversation you mention that you also have a rooster, like we do, one of two things generally happens. Either, people say something along the lines of, “Of course, because otherwise you wouldn’t get any eggs right?” and then you try not to physically slap your forehead in frustration with the poor biology background of the general populace and go on to give a well rehearsed mini-biology lesson of your own. Or, they say something along the lines of, “But don’t you worry it’s going to attack your children, kill your cats, run your dogs out of the neighborhood and crow night and day driving you crazy?! ?” and then you try not to sigh, because they clearly have had a traumatic rooster incident and now you must gently explain to that, despite the incident that scarred them for life, your rooster is quite well behaved because anything less than stellar behavior would earn him a quick trip to the soup pot. Rarely someone will nod knowingly, perhaps a fellow poultry person, because they know that a good rooster in a free range flock is worth the chicken feed he eats and more. In fact, I will go so far as to say I would never want to have a flock without one. I’m not exactly sure what goes through a hen’s brain as she walks around doing her chickeny things but none of it seems to have to do with awareness of surroundings and self-preservation. It’s possible the chicken crossed the road because the rooster wasn’t around to tell her it was a dumb idea. While the hens are happily meandering about, the rooster (the current one goes by name of Roosty) is on guard duty. 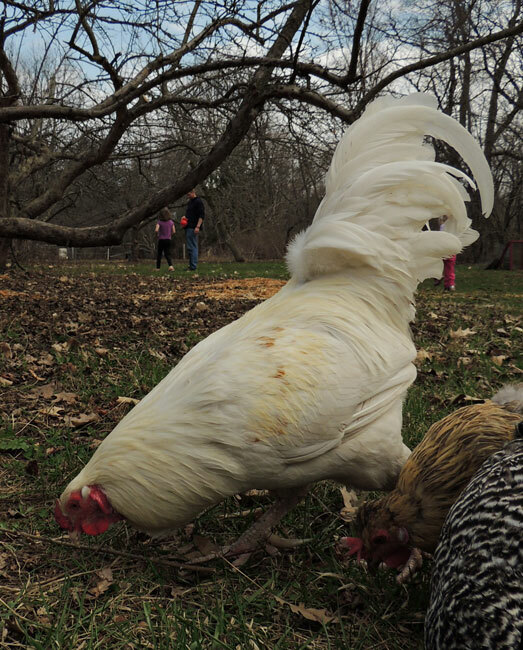 A hawk flies overhead and the hens continue to scratch at the ground – until Roosty (yes, the kids named him) spots it. He’ll give an alarm call and quick as a wink the chickens all vanish under bushes and whatever else they can find, and hunker down until it’s gone. While we’ve lost chickens to hawks between roosters, we’ve yet to have them get one since Roosty’s been on the job! Whenever his guard duties aren’t demanding his immediate attention, Roosty busies himself by searching the ground for extra treats, calling his ladies over to share whatever he finds. And as his final rooster duty, he has proven himself with an impressive fertility rate on eggs I gave a friend to hatch. Since she lives in town with a cap on chicken numbers and a ban on roosters, the extras were sent back to us. When all was said and done we had seven extra roosters. Not all roosters are created equal and chances of nastiness seem to increase the more you have. And this situation was no different. But even though the new roosters were crowing up a storm and starting to do quite a bit of posturing and mini rooster fights amongst themselves, the young boys were, well, scrawny. As we waited for them to get a bit plumper, Roosty had his work cut out for him. All the birds would be peacefully roaming around when one of the young (and might I add slightly evil) roosters would spy a lone hen and take off like an arrow through the grass after her. Stretched out, flattened to the ground, running full tilt they’d race across the orchard, joined by any other young rooster that may have caught sight of them. When the youngsters caught the poor girl, the whole group would start in on behavior that would earn them a decent amount of jail time if they were human. Fortunately Roosty was on the job. As soon as he heard the commotion, he’d go running and flapping across the yard and shove himself right into the middle of the chaos. I never saw him fight another rooster, he’d just strut into the middle and the young boys would break it off. Straightening up, they’d slink away as if trying to say “What? I wasn’t doing anything! Besides I was just leaving anyway…” and Roosty would usher the poor hen back toward the rest of the flock. While watching this show was both entertaining and educational, it was also very noisy for us humans and looked exhausting for the chickens. We were all sticking it out waiting for the new boys to get just a bit bigger when one of them pecked at Jane. Not only did he peck her leg but then he stood watching Jane scream with feathers plumped in a threatening manner until I came at a run to give him the boot (literally) and rescue her. Sadly, Roosty’s fierce protective instincts don’t extend to anything without feathers. While I love having a rooster around, we have a one strike rule when it comes to aggression toward humans. Roosty has never so much as looked at us sideways, but this young rooster had crossed the line. With that single and final strike, it was time for all the roosters to go. And just like that we are back to lone rooster status. The crowing has receded to a barely noticeable level, the freezer has a few new packages and Roosty, still on the job, looks just a bit more relaxed without his added duties. So next time someone tells you they have a rooster, nod your head sagely and smile because now you know. A good rooster is worth that extra chicken feed. The following is a public service announcement for future boyfriends of my children. At approximately 1000 hours last Saturday this rooster was seen threatening the girls. At approximately 1001 hours on Saturday John exploded out of the house to the children’s rescue. And at approximately 1001.05 hours Archibald the rooster was no more and we had a new dinner plan. This concludes today’s public service announcement. 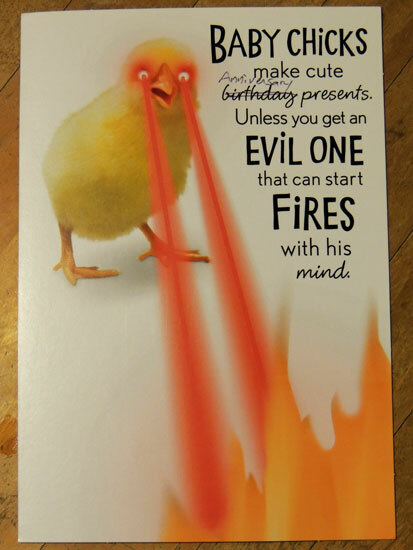 For starters we’ve been married 12 years and we have I have brought home hundreds of baby chicks. So far, not a single pyro among them. …I think you are missing the big picture here. 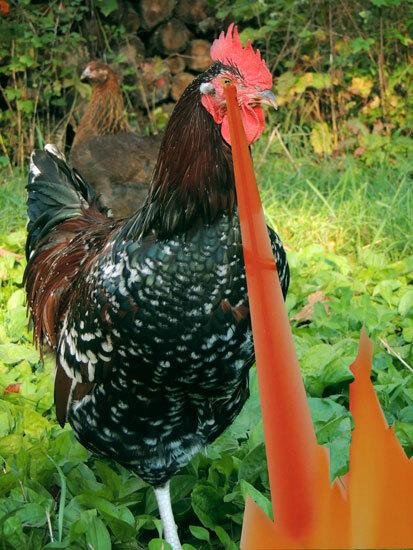 Just imagine – a ROOSTER that could start fires with it’s mind. Maybe if we are lucky we’ll run across one sometime in our next 12 years! Or, they say something along the lines of, “But don’t you worry it’s going to attack your children, kill your cats, run your dogs out of the neighborhood and crow night and day driving you crazy?! ?” and then you try not to sigh, because they clearly have had a traumatic rooster incident and now you must gently explain to that despite the incident that scarred them for life that your rooster is quite well behaved because anything less than stellar behavior would earn him a quick trip to the soup pot. I’m not exactly sure what goes through a hen’s brain as she walks around doing her chickeny things but none of it seems to have to do with awareness of surroundings and self-preservation. It’s possible the chicken crossed the road because the rooster wasn’t around to tell her it was a dumb idea. While the hens are happily meandering about, the rooster (the current one goes by name of Roosty) is on guard duty. A hawk flies overhead and the hens continue to scratch at the ground – until Roosty (yes, the kids named him) spots it. He’ll give an alarm call and quick as a wink the chickens all vanish under bushes and whatever else they can find, and hunker down until it’s gone. While we we’ve lost chickens to hawks between roosters, we’ve yet to have them get one since Roosty’s been on the job! All the birds would be peacefully roaming around when one of the young (and might I add slightly evil) roosters would spy a lone hen and take off like an arrow through the grass after her. Stretched out, flattened to the ground, running full tilt they’d race across the orchard, joined by any other young rooster that may have caught sight of them. When the youngsters caught the poor girl, the whole group would start in on behavior that would earn them a decent amount of jail time if they were human. Fortunatly Roosty was on the job. As soon as he heard the commotion, he’d go running and flapping across the yard and shove himself right into the middle of the chaos. I never saw him fight another rooster, he’d just strut into the middle and the young boys would break it off. Straightening up, they’d slink away as if trying to say “What? I wasn’t doing anything! Besides I was just leaving anyway…” and Roosty would usher the poor hen back toward the rest of the flock. While watching this show was both entertaining and educational, it was also very noisy for us humans and looked exhausting for the chickens. We were all sticking it out waiting for the new boys to get just a bit bigger when one of them pecked at Jane. Not only did he peck her leg but then he stood watching Jane scream with feathers plumped in a threatening manner until I came at a run to give him the boot (literally)and rescue her. Sadly, Roosty’s fierce protective instincts don’t extend to anything without feathers. While I love having a rooster around, we have a one strike rule when it comes to aggression toward humans. Roosty has never so much as looked at us sideways, but this young rooster had crossed the line.